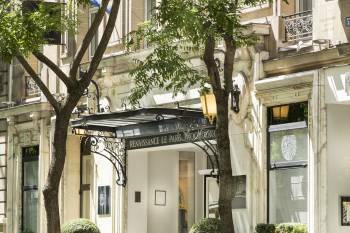 A historic treasure in one of Europe’s most charming cities, the Renaissance Paris Hotel Le Parc Trocadero offers an ideal location between the Champs-Elysees and Eiffel Tower. Our downtown Paris, France hotel welcomes you in elegant hotel rooms and suites with impeccable service. With first-class facilities the Renaissance hotel in downtown Paris, France features 6 event rooms. This downtown Paris hotel offers 122 hotel rooms and suites with safe, flat-panel TVs, broadband internet and plush bedding. Exercise in the 24/7 free fitness gym or catch up with colleagues and relax with friends at our bar, library or stunning outdoor garden. The restaurant Le Relais du Parc, created by Alain Ducasse, offers a simple and tasty cuisine that will remind you of familly meals and convivial moments. Whether traveling for business or vacations, you’ll find a haven for peace and relaxation in downtown Paris, France.